Explanation: A study in contrasts, this colorful skyscape features stars, dust, and glowing gas in the vicinity of NGC 6914. The complex of reflection nebulae lies some 6,000 light-years away, toward the high-flying northern constellation Cygnus and the plane of our Milky Way Galaxy. 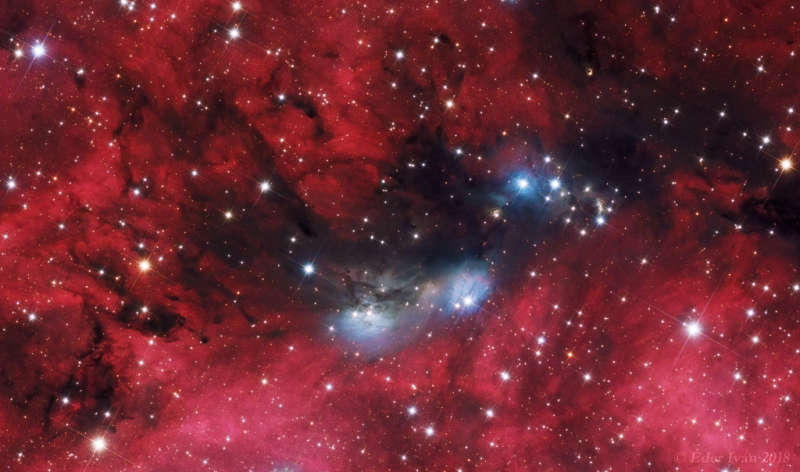 Obscuring interstellar dust clouds appear in silhouette while reddish hydrogen emission nebulae, along with the dusty blue reflection nebulae, fill the cosmic canvas. Ultraviolet radiation from the massive, hot, young stars of the extensive Cygnus OB2 association ionize the region's atomic hydrogen gas, producing the characteristic red glow as protons and electrons recombine. Embedded Cygnus OB2 stars also provide the blue starlight strongly reflected by the dust clouds. The nearly 1 degree wide telescopic field of view spans about 100 light-years at the estimated distance of NGC 6914.